37 CFR 1.135 Abandonment for failure to reply within time period. 37 CFR 1.138 Express abandonment. (a) An application may be expressly abandoned by filing a written declaration of abandonment identifying the application in the United States Patent and Trademark Office. Express abandonment of the application may not be recognized by the Office before the date of issue or publication unless it is actually received by appropriate officials in time to act. (b) A written declaration of abandonment must be signed by a party authorized under § 1.33(b)(1) or (b)(3) to sign a paper in the application, except as otherwise provided in this paragraph. A registered attorney or agent, not of record, who acts in a representative capacity under the provisions of § 1.34 when filing a continuing application, may expressly abandon the prior application as of the filing date granted to the continuing application. 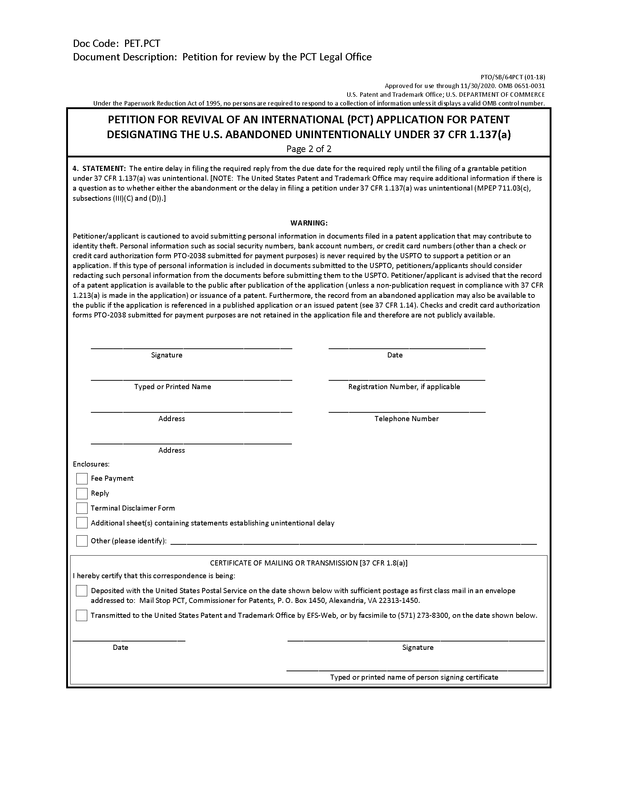 (c) An applicant seeking to abandon an application to avoid publication of the application (see § 1.211(a)(1)) must submit a declaration of express abandonment by way of a petition under this section including the fee set forth in § 1.17(h) in sufficient time to permit the appropriate officials to recognize the abandonment and remove the application from the publication process. Applicant should expect that the petition will not be granted and the application will be published in regular course unless such declaration of express abandonment and petition are received by the appropriate officials more than four weeks prior to the projected date of publication. Abandonment may be either of the invention or of an application. This discussion is concerned with abandonment of the application for patent. (B) failure of applicant to take appropriate action within a specified time at some stage in the prosecution of the application. If the letter expressly abandoning the application does comply with 37 CFR 1.138, the Office personnel should respond by using a “Notice of Abandonment” form PTO-1432, and by checking the appropriate box(es). If such a letter does not comply with the requirements of 37 CFR 1.138, a fully explanatory letter should be sent. 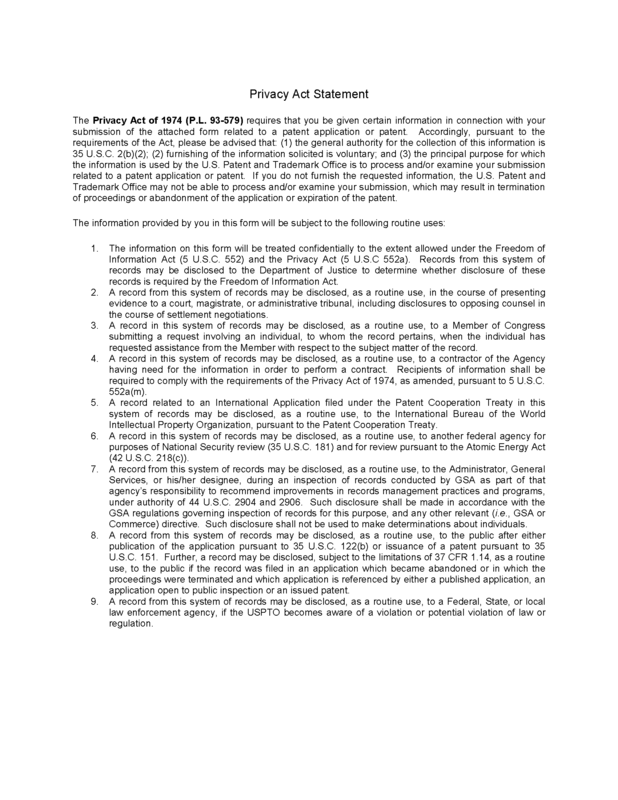 An “examination has been made of the application” for purposes of 37 CFR 1.138(d) once an action (e.g., restriction or election of species requirement, requirement for information under 37 CFR 1.105, first Office action on the merits, notice of allowability or notice of allowance, or action under Ex parte Quayle, 1935 Dec. Comm’r Pat. 11 (1935)) is shown in the Patent Application Locating and Monitoring (PALM) system as having been counted. For purposes of 37 CFR 1.138(d), “before” means occurring earlier in time, in that if a petition under 37 CFR 1.138(d) is filed and an action is counted on the same day, the petition under 37 CFR 1.138(d) was not filed before an examination has been made of the application. In addition, the date indicated on any certificate of mailing or transmission under 37 CFR 1.8 is not taken into account in determining whether a petition under 37 CFR 1.138(d) was filed before an examination has been made of the application. 37 CFR 1.135(a) specifies that an application becomes abandoned if applicant “fails to reply” to an office action within the fixed statutory period. This failure may result either from (A) failure to reply within the statutory period, or (B) insufficiency of reply, i.e., failure to file a “complete and proper reply, as the condition of the case may require” within the statutory period (37 CFR 1.135(b)). 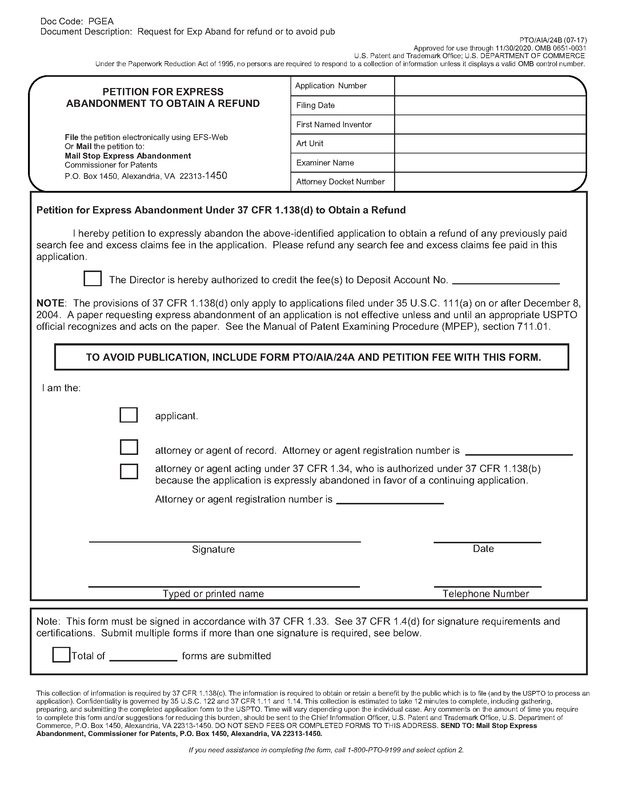 A petition to revive an abandoned application on the grounds that the failure to reply was unintentional (37 CFR 1.137) must be accompanied by: (1) the required reply (which has been filed); (2) a statement that the entire delay in filing the required reply from the due date for the reply until the filing of a grantable petition pursuant to 37 CFR 1.137 was unintentional; (3) any terminal disclaimer required pursuant to 37 CFR 1.137(d); and (4) the $ petition fee as set forth in 37 CFR 1.17(m). No consideration to the substance of a petition will be given until this fee is received. The Director may require additional information where there is a question whether the delay was unintentional. 1. In bracket 2, set forth why the examiner considers there to be a failure to take “complete and proper action” within the statutory period. (A) Copying claims from a patent when not suggested by the U.S. Patent and Trademark Office does not constitute a reply to the last Office action and will not save the application from abandonment, unless the last Office action relied solely on the patent for the rejection of all the claims rejected in that action. (B) An application may become abandoned through withdrawal of, or failure to prosecute, an appeal to the Patent Trial and Appeal Board. See MPEP §§ 1215.01 to 1215.04. (C) An application may become abandoned through dismissal of appeal to the Court of Appeals for the Federal Circuit or civil action, where there was not filed prior to such dismissal an amendment putting the application in condition for issue or fully responsive to the Board’s decision. Abandonment results from failure to perfect an appeal as required by the Court of Appeals for the Federal Circuit. See MPEP §§ 1215.04 and 1216.01. (D) Where claims are suggested for interference near the end of the period for reply running against the application. See MPEP Chapter 2300. (E) Where a continued prosecution application (CPA) under 37 CFR 1.53(d) is filed. 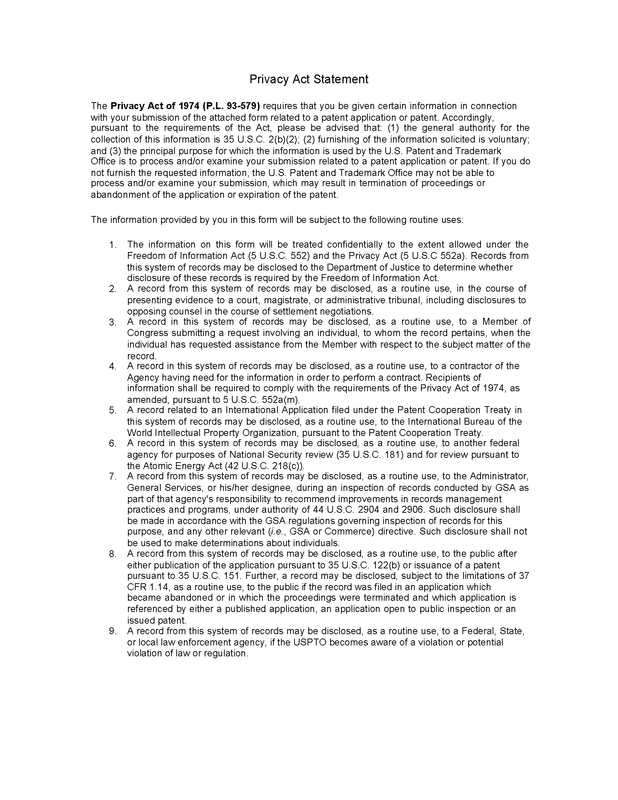 See MPEP §§ 201.06(d) and 711.01. (F) Prior to a decision by the Board, an application on appeal that has no allowed claims may become abandoned when a Request for Continued Examination (RCE) is improperly filed without the appropriate fee or a submission (37 CFR 1.114(d)) in the application. The filing of an RCE will be treated as a withdrawal of the appeal by the applicant. See MPEP § 706.07(h), subsection X. (G) When a reply to a final Office action is outstanding, an application may become abandoned if an RCE is filed without a timely submission that meets the reply requirements of 37 CFR 1.111. The filing of an improper RCE will not operate to toll the running of any time period set in the previous Office action for reply to avoid abandonment of the application. See MPEP § 706.07(h), subsection VI. (H) Prior to payment of the issue fee, an allowed application may become abandoned if an RCE is improperly filed without the appropriate fee or a submission in the application. The improper RCE will not operate to toll the running of the time period for payment of the issue fee. See MPEP § 706.07(h), subsection IX. (C) termination of proceedings on the earlier application. (A) When the issue fee is not paid and the application is abandoned for failure to pay the issue fee, proceedings are terminated as of the date the issue fee was due and the application is the same as if it were abandoned after midnight on that date (but if the issue fee is later accepted, on petition, the application is revived). See MPEP § 711.03(c). (B) If an application is in interference wherein all the claims present in the application correspond to the counts and the application loses the interference as to all the claims, then proceedings on that application are terminated as of the date appeal or review by civil action was due if no appeal or civil action was filed. (C) Proceedings are terminated in an application after decision by the Patent Trial and Appeal Board as explained in MPEP § 1214.06. (D) Proceedings are terminated after a decision by the court as explained in MPEP § 1216.01. Applicant may deny that the reply was incomplete. While the primary examiner has no authority to act upon an application in which no action by applicant was taken during the period for reply, he or she may reverse his or her holding as to whether or not an amendment received during such period was responsive and act on an application of such character which he or she has previously held abandoned. This is not a revival of an abandoned application but merely a holding that the application was never abandoned. See also MPEP § 714.03. When an amendment reaches the U.S. Patent and Trademark Office after the expiration of the period for reply and there is no dispute as to the dates involved, no question of reconsideration of a holding of abandonment can be presented. However, the examiner and the applicant may disagree as to the date on which the period for reply commenced to run or ends. In this situation, as in the situation involving sufficiency of reply, the applicant may take issue with the examiner and point out to him or her that his or her holding was erroneous. 37 CFR 1.181 Petition to the Director. In Delgar v. Schuyler, 172 USPQ 513 (D.D.C. 1971), the court decided that the Office should mail a new Notice of Allowance in view of the evidence presented in support of the contention that the applicant’s representative did not receive the original Notice of Allowance. Under the reasoning of Delgar, an allegation that an Office action was never received may be considered in a petition to withdraw the holding of abandonment. If adequately supported, the Office may grant the petition to withdraw the holding of abandonment and remail the Office action. That is, the reasoning of Delgar is applicable regardless of whether an application is held abandoned for failure to timely pay the issue fee (35 U.S.C. 151) or for failure to prosecute (35 U.S.C. 133). 37 CFR 1.10(c) through 1.10(e) and 1.10(g) set forth procedures for petitioning the Director of the USPTO to accord a filing date to correspondence as of the date of deposit of the correspondence as Priority Mail Express®. 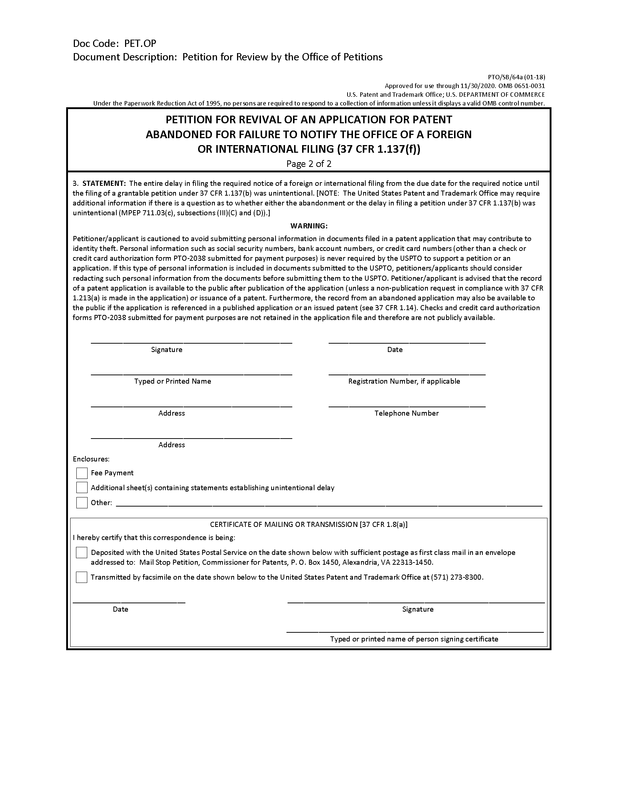 A petition to withdraw the holding of abandonment relying upon a timely reply placed in Priority Mail Express® must include an appropriate petition under 37 CFR 1.10(c), (d), (e), or (g) (see MPEP § 513). When a paper is shown to have been mailed to the Office using the “Express Mail” procedures, the paper must be entered in PALM with the Priority Mail Express® date. Where a certificate of mailing under 37 CFR 1.8, but not a postcard receipt, is relied upon in a petition to withdraw the holding of abandonment, see 37 CFR 1.8(b) and MPEP § 512. As stated in 37 CFR 1.8(b)(3) the statement that attests to the previous timely mailing or transmission of the correspondence must be on a personal knowledge basis, or to the satisfaction of the Director of the USPTO. If the statement attesting to the previous timely mailing is not made by the person who signed the Certificate of Mailing (i.e., there is no personal knowledge basis), then the statement attesting to the previous timely mailing should include evidence that supports the conclusion that the correspondence was actually mailed (e.g., copies of a mailing log establishing that correspondence was mailed for that application). When the correspondence is shown to have been timely filed based on a certificate of mailing, the correspondence is entered into PALM with the actual date of receipt (i.e., the date that the duplicate copy of the papers was filed with the statement under 37 CFR 1.8). 37 CFR 1.181(f) provides that, inter alia, except as otherwise provided, any petition not filed within 2 months from the action complained of may be dismissed as untimely. Therefore, any petition (under 37 CFR 1.181) to withdraw the holding of abandonment not filed within 2 months of the mail date of a notice of abandonment (the action complained of) may be dismissed as untimely. 37 CFR 1.181(f). Where the record indicates that the applicant intentionally delayed the filing of a petition to withdraw the holding of abandonment, the Office may simply dismiss the petition as untimely (37 CFR 1.181(f)) solely on the basis of such intentional delay in taking action in the application without further addressing the merits of the petition. Obviously, intentional delay in seeking the revival of an abandoned application precludes relief under 37 CFR 1.137(a) (discussed below). In utility and plant applications filed on or after June 8, 1995, but before May 29, 2000, a terminal disclaimer should not be required as a condition of granting an untimely petition to withdraw the holding of abandonment. However, the Office of Patent Legal Administration (OPLA) must be consulted in such situations if the holding of abandonment involves a period during: (A) appellate review by the Patent Trial and Appeal Board; (B) an interference or derivation proceeding under 35 U.S.C. 135, including any suspension due to an interference or derivation proceeding; or (C) which the application was in a sealed condition or prosecution was suspended due to a secrecy order under 35 U.S.C. 181. This is because it is necessary to effect (if appropriate) a reduction of patent term extension under the “due diligence” provisions of 37 CFR 1.701(d)(2). In utility and plant applications filed on or after May 29, 2000, a terminal disclaimer should not be required as a condition of granting an untimely petition to withdraw the holding of abandonment. 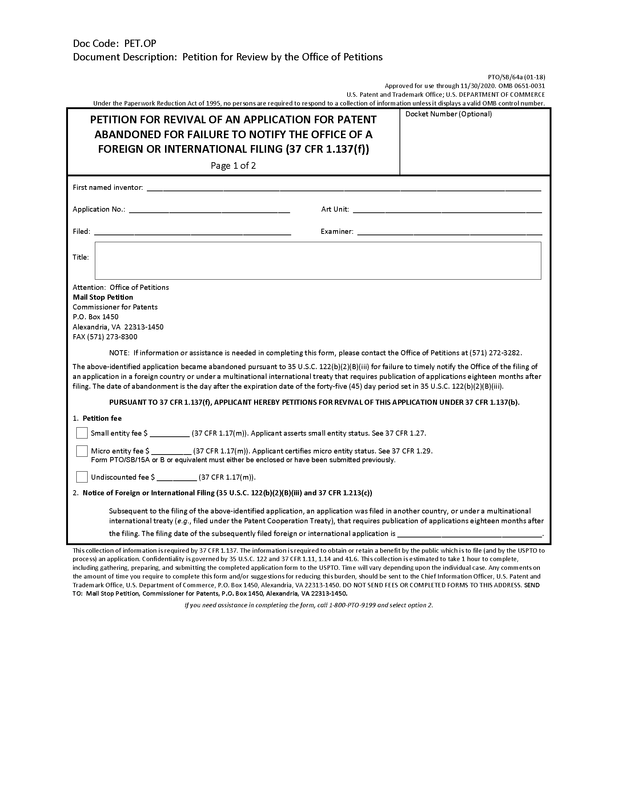 This is because any patent term adjustment is automatically reduced under the provisions of 37 CFR 1.704(c)(4) in applications subject to the patent term adjustment provisions of the American Inventors Protection Act of 1999 (AIPA) if a petition to withdraw a holding of abandonment is not filed within two months from the mailing date of the notice of abandonment, and if applicant does not receive the notice of abandonment, any patent term adjustment is reduced under the provisions of 37 CFR 1.704(a) by a period equal to the period of time during which the applicant “failed to engage in reasonable efforts to conclude prosecution” (processing or examination) of the application. Effective December 18, 2013, the Patent Law Treaties Implementation Act of 2012 (PLTIA), Public Law 112-211, amended the patent laws to implement the provisions of the Patent Law Treaty (PLT) in title II. Notable changes to the law included the restoration of patent rights via the revival of abandoned applications and acceptance of delayed maintenance fee payments. Section 201(b) of the PLTIA specifically added new 35 U.S.C. 27, providing that the Director may establish procedures to revive an unintentionally abandoned application for patent, accept an unintentionally delayed payment of the fee for issuing a patent, or accept an unintentionally delayed response by the patent owner in a reexamination proceeding, upon petition by the applicant for patent or patent owner. The PLTIA eliminated the provisions of the patent statutes relating to revival of abandoned applications or acceptance of delayed maintenance fee payments on the basis of a showing of “unavoidable” delay. 35 U.S.C. 41(a)(7) authorizes the acceptance of an “unintentionally delayed payment of the fee for issuing each patent.” Thus, 35 U.S.C. 41(a)(7) requires payment of the issue fee as a condition of reviving an application abandoned for failure to pay the issue fee. Therefore, the filing of a continuing application without payment of the issue fee is not an acceptable reply in an application abandoned for failure to pay the issue fee. 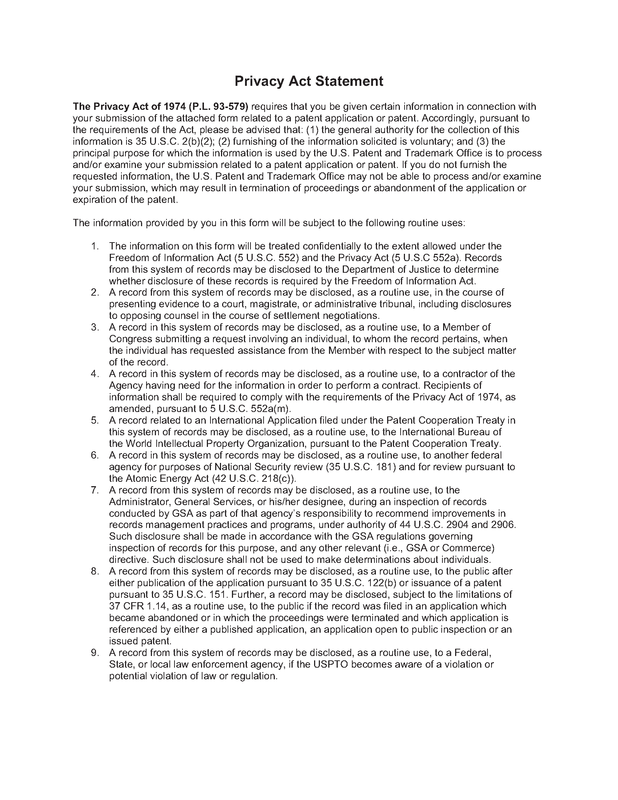 An application subject to a final action in which a proposed amendment under 37 CFR 1.116 is filed as the required reply will normally be routed by the Office of Petitions to the Technology Center (TC) to determine whether a proposed amendment places the application in condition for allowance prior to granting any petition to revive such application. The examiner is instructed that if the reply places the application in condition for allowance, the examiner should use the typewriter tool in Adobe Acrobat to write in the margin of the reply “OK to enter upon revival.” If the petition is otherwise grantable and the examiner indicates that the reply places the application in condition for allowance, the petition will be granted. If, on the other hand, the reply would not place the application in condition for allowance, the examiner is instructed to complete form PTOL-303 and return the form to the Office of Petitions with the application. Form PTOL-303 should not be mailed to the applicant by the examiner. In this situation, the Office of Petitions will not grant the petition. A copy of the form PTOL-303 is marked with the notation “Courtesy Copy” by the Office of Petitions. The courtesy copy is sent as an attachment with the decision on the petition. The advisory form PTOL-303 merely serves as an advisory notice to the Office of Petitions regarding the decision of the examiner on the amendment after final rejection. For utility or plant applications abandoned for failure to reply to a final Office action or for failure to file an appeal brief, the required reply may be the filing of an RCE accompanied by a submission and the requisite fee. When an RCE is the reply filed pursuant to 37 CFR 1.137(b)(1) to revive such an application, the submission accompanying the RCE must be a reply responsive within the meaning of 37 CFR 1.111 to the last Office action. Consideration of whether the submission is responsive within the meaning of 37 CFR 1.111 to the last Office action is done without factoring in the “final” status of such action. The submission may be a previously filed amendment after final or a statement that incorporates by reference the arguments in a previously filed appeal or reply brief. See MPEP § 706.07(h), subsection II. (C) the reply or replies submitted under 37 CFR 1.137(b)(1)) are questionable as to compliance with 37 CFR 1.111 or 1.113. 35 U.S.C. 41(a)(7) provides that the Office shall charge $1,700.00 on filing each petition for the revival of an abandoned application for a patent, for the delayed payment of the fee for issuing each patent, for the delayed response by the patent owner in any reexamination proceeding, for the delayed payment of the fee for maintaining a patent in force, for the delayed submission of a priority or benefit claim, or for the extension of the 12-month period for filing a subsequent application. 35 U.S.C. 41(a)(7) also provides that the Director may refund any part of the fee, in exceptional circumstances as determined by the Director. This provision permits the Office to refund (or waive) the fee specified in 35 U.S.C. 41(a)(7) in situations in which the failure to take the required action or pay the required fee was due to a widespread disaster, such as a hurricane, earthquake, or flood, in the manner that the Office would waive surcharges that are not required by statute. The “exceptional circumstances” provision does not permit applicants to request a refund on the basis of there being exceptional circumstances. The phrase “[o]n filing” in 35 U.S.C. 41(a)(7) means that the petition fee is required for the filing (and not merely the grant) of a petition under 37 CFR 1.137. See H.R. Rep. No. 542, 97th Cong., 2d Sess. 6 (1982), reprinted in 1982 U.S.C.C.A.N. 770 (“[t]he fees set forth in this section are due on filing the petition”). Therefore, the Office: (A) will not refund the petition fee required by 37 CFR 1.17(m), regardless of whether the petition under 37 CFR 1.137 is dismissed or denied (unless there are exceptional circumstances as determined by the Director); and (B) will not reach the merits of any petition under 37 CFR 1.137 lacking the requisite petition fee. 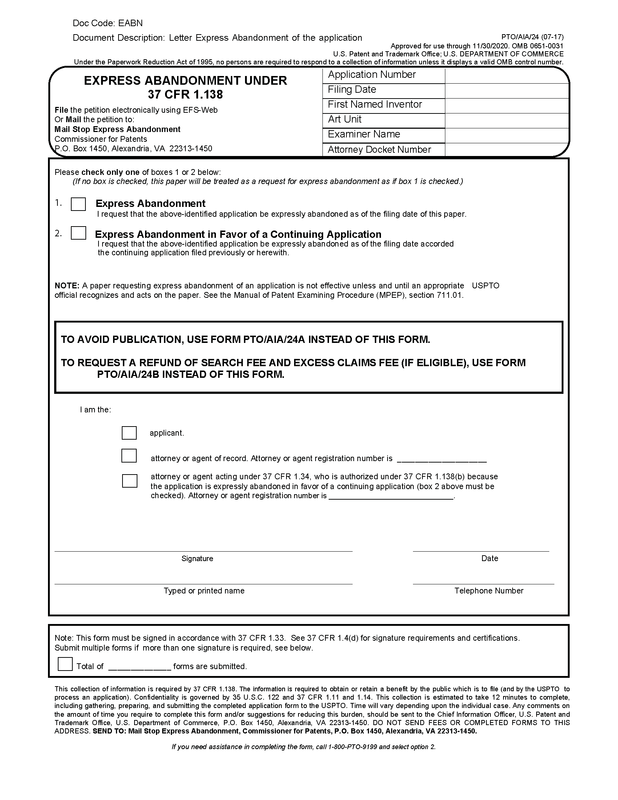 While the Office reserves the authority to require further information concerning the cause of abandonment and delay in filing a petition to revive, the Office relies upon the applicant’s duty of candor and good faith and accepts the statement that “the entire delay in filing the required reply from the due date for the reply until the filing of a grantable petition pursuant to 37 CFR 1.137(a) was unintentional” without requiring further information in the vast majority of petitions under 37 CFR 1.137(a). This is because the applicant is obligated under 37 CFR 11.18 to inquire into the underlying facts and circumstances when a practitioner provides this statement to the Office. In addition, providing an inappropriate statement in a petition under 37 CFR 1.137(a) to revive an abandoned application may have an adverse effect when attempting to enforce any patent resulting from the application. See Lumenyte Int’l Corp. v. Cable Lite Corp., Nos. 96-1011, 96-1077, 1996 U.S. App. LEXIS 16400, 1996 WL 383927 (Fed. Cir. July 9, 1996)(unpublished)(patents held unenforceable due to a finding of inequitable conduct in submitting an inappropriate statement that the abandonment was unintentional). The Office is almost always satisfied as to whether “the entire delay…was unintentional” on the basis of statement(s) by the applicant or representative explaining the cause of the delay (accompanied at most by copies of correspondence relevant to the period of delay). The legislative history of Public Law 97-247, § 3, 96 Stat. 317 (1982), reveals that the purpose of 35 U.S.C. 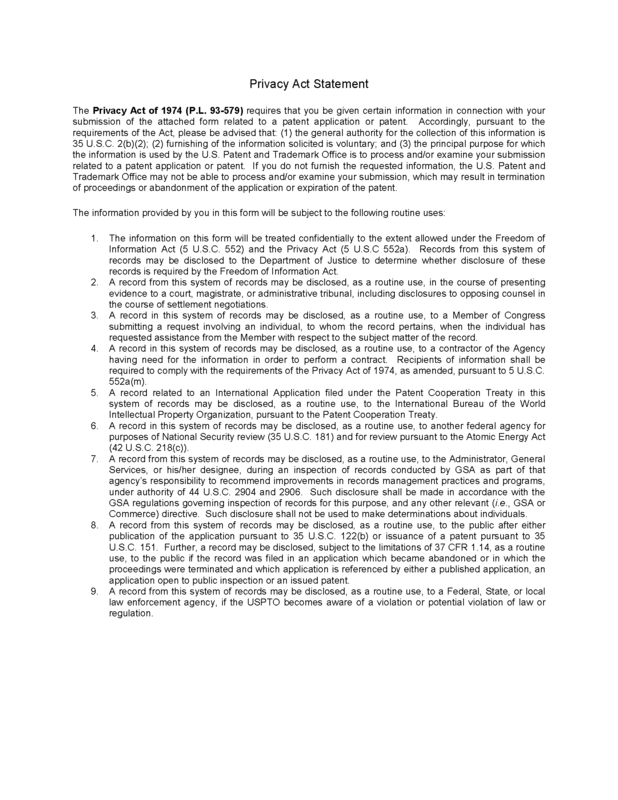 41(a)(7) is to permit the Office to have discretion to revive abandoned applications in appropriate circumstances, but places a limit on this discretion stating that “[u]nder this section a petition accompanied by [the requisite fee] would not be granted where the abandonment or the failure to pay the fee for issuing the patent was intentional as opposed to being unintentional or unavoidable.” H.R. Rep. No. 542, 97th Cong., 2d Sess. 6-7 (1982), reprinted in 1982 U.S.C.C.A.N. 770-71. A delay resulting from a deliberately chosen course of action on the part of the applicant is not an “unintentional” delay within the meaning of 37 CFR 1.137. Where the applicant deliberately permits an application to become abandoned (e.g., due to a conclusion that the claims are unpatentable, that a rejection in an Office action cannot be overcome, or that the invention lacks sufficient commercial value to justify continued prosecution), the abandonment of such application is considered to be a deliberately chosen course of action, and the resulting delay cannot be considered as “unintentional” within the meaning of 37 CFR 1.137. See In re Application of G, 11 USPQ2d 1378, 1380 (Comm’r Pat. 1989). An intentional course of action is not rendered unintentional when, upon reconsideration, the applicant changes his or her mind as to the course of action that should have been taken. See In re Maldague, 10 USPQ2d 1477, 1478 (Comm’r Pat. 1988). Likewise, a change in circumstances that occurred subsequent to the abandonment of an application does not render “unintentional” the delay resulting from a previous deliberate decision to permit an application to be abandoned. These matters simply confuse the question of whether there was a deliberate decision not to continue the prosecution of an application with why there was a deliberate decision not to continue the prosecution of an application. 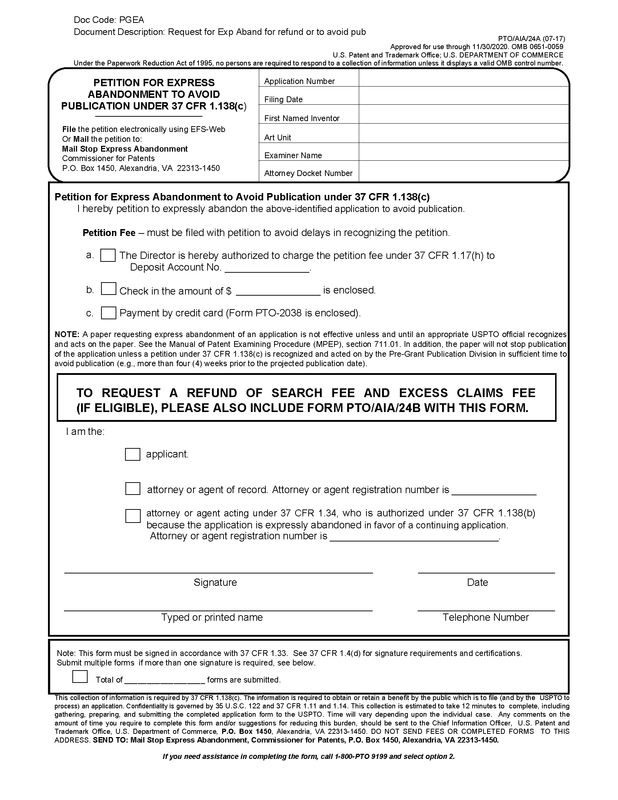 In order to expedite treatment, applicants filing a petition under 37 CFR 1.137 to revive an abandoned application are advised to include the statement “the entire delay in filing the required reply from the due date for the reply until the filing of a grantable petition pursuant to 37 CFR 1.137(a) was unintentional,” even if applicant chooses to include a statement of the facts concerning the delay. 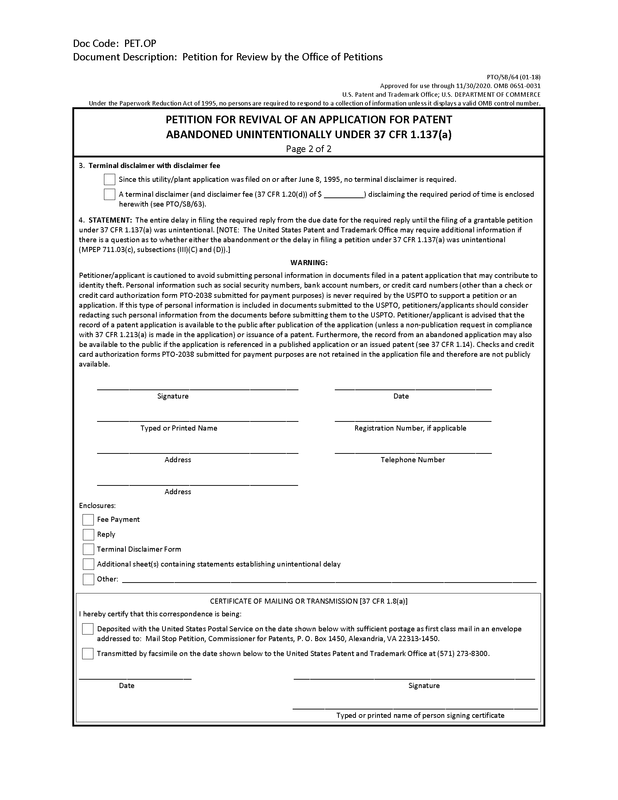 Electronic petitions, that are automatically processed and immediately decided, may be filed using the Web-based ePetition process for the following types of petitions: (1) Petitions to Accept Late Payment of Issue Fee - Unintentional Late Payment (37 CFR 1.137(a)); (2) Petitions for Revival of an Application based on Failure to Notify the Office of a Foreign or International Filing (37 CFR 1.137(f)); (3) Petitions for Revival of an Application for Continuity Purposes Only (37 CFR 1.137(a)); and (4) Petitions for Revival of an Abandoned Patent Application Abandoned Unintentionally (37 CFR 1.137(a)) (For Cases Abandoned After 1st Action and Prior to Notice of Allowance). Applicants may use the forms provided by the Office (PTO/SB/64, PTO/SB/64a, or PTO/SB/64PCT). 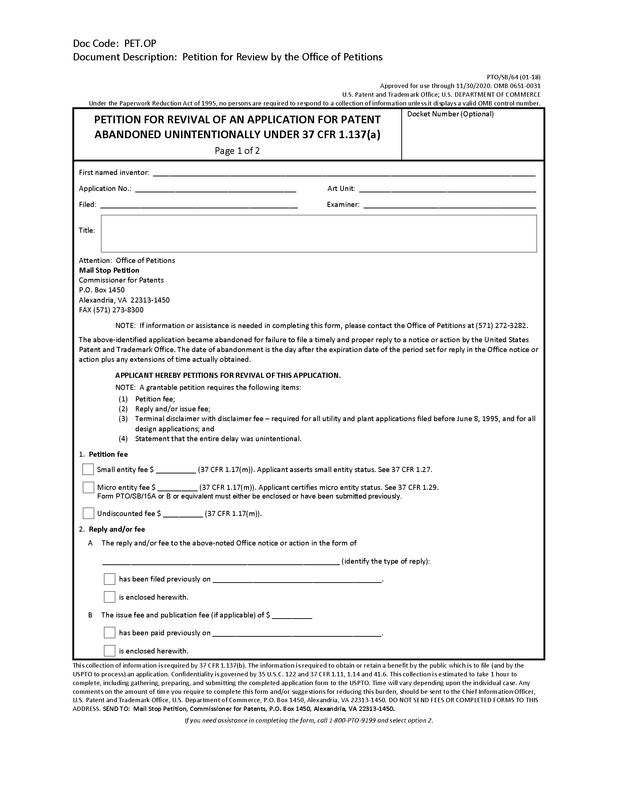 Additional information regarding the ePetition process is available from: www.uspto.gov/patents-application-process/applying-online/ epetition-resource-page. Obviously, delaying the revival of an abandoned application, by a deliberately chosen course of action, until the industry or a competitor shows an interest in the invention is the antithesis of an “unintentional” delay. An intentional abandonment of an application, or an intentional delay in seeking the revival of an abandoned application, precludes a finding of unavoidable or unintentional delay pursuant to 37 CFR 1.137. See Maldague, 10 USPQ2d at 1478. Applicant’s failure to carry the burden of proof to establish that the “entire” delay was “unintentional” may lead to the denial of a petition under 37 CFR 1.137, regardless of the circumstances that originally resulted in the abandonment of the application. 37 CFR 1.137(b)(4) requires that a petition under 37 CFR 1.137 must be accompanied by a statement that the entire delay in providing the required reply from the due date for the reply until the filing of a grantable petition pursuant to 37 CFR 1.137 was unintentional, but also provides that “[t]he Director may require additional information where there is a question whether the delay was unintentional.” While the Office will generally require only the statement that the entire delay in providing the required reply from the due date for the reply until the filing of a grantable petition pursuant to 37 CFR 1.137 was unintentional, the Office may require an applicant to carry the burden of proof to establish that the delay from the due date for the reply until the filing of a grantable petition was unintentional within the meaning of 35 U.S.C. 27 and 37 CFR 1.137 where there is a question whether the entire delay was unintentional. See Application of G, 11 USPQ2d at 1380. The filing of a terminal disclaimer is not a substitute for unintentional delay. See Application of Takao, 17 USPQ2d at 1159. The requirement that the entire delay have been unintentional (37 CFR 1.137) is distinct from the requirement for a terminal disclaimer. Therefore, the filing of a terminal disclaimer cannot excuse an intentional delay in filing a petition or renewed petition to revive an abandoned application. Likewise, an unintentional delay in filing a petition or renewed petition to revive an abandoned application will not warrant waiver of the terminal disclaimer requirement of 37 CFR 1.137(d). 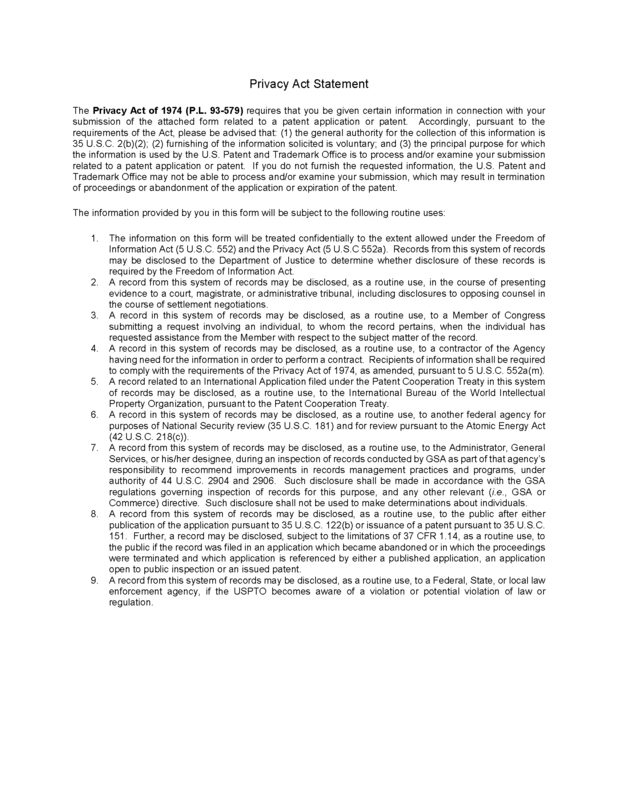 In the event that an applicant considers the requirement for a terminal disclaimer to be inappropriate under the circumstances of the application at issue, the applicant should file a petition under 37 CFR 1.183 (and petition fee) to request a waiver of this requirement of 37 CFR 1.183. Such a petition may request waiver of this requirement in toto, or to the extent that such requirement exceeds the period considered by applicant as the appropriate period of disclaimer. The grant of such a petition, however, is strictly limited to situations wherein applicant has made a showing of an “extraordinary situation” in which “justice requires” the requested relief. An example of such a situation is when the abandonment of the application caused no actual delay in prosecution (e.g., an application awaiting decision by the Board of Appeals and Interferences during period of abandonment). 37 CFR 1.137(e) specifies a time period within which a renewed petition pursuant to 37 CFR 1.137 must be filed to be considered timely. 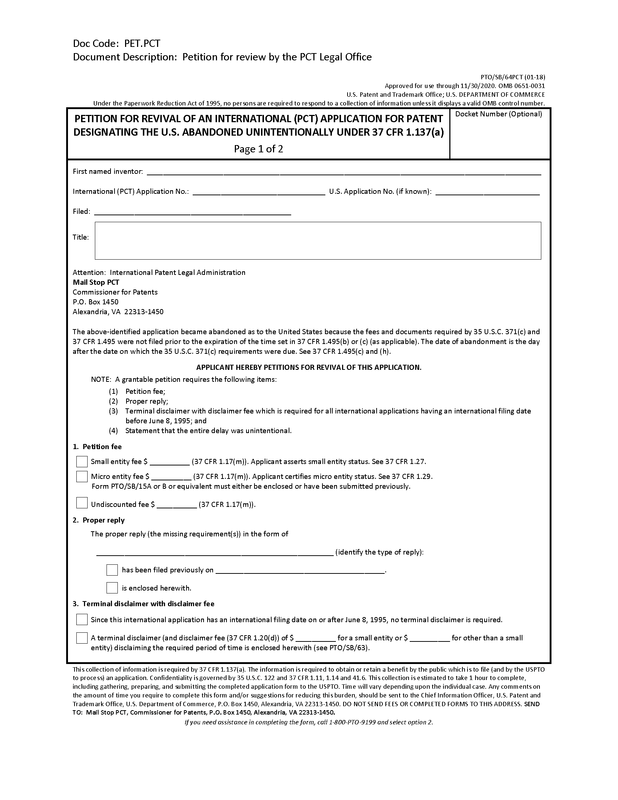 Where an applicant files a renewed petition, request for reconsideration, or other petition seeking review of a prior decision on a petition pursuant to 37 CFR 1.137 outside the time period specified in 37 CFR 1.137(e), the Office may require, inter alia, a specific showing as to how the entire delay was “unintentional.” As discussed above, a delay resulting from the applicant deliberately choosing not to persist in seeking the revival of an abandoned application cannot be considered “unintentional” within the meaning of 37 CFR 1.137, and the correctness or propriety of the decision on the prior petition pursuant to 37 CFR 1.137, the correctness of the applicant’s (or the applicant’s representative’s) decision not to persist in seeking revival, the discovery of new information or evidence, or other change in circumstances subsequent to the abandonment or decision to not persist in seeking revival are immaterial to such intentional delay caused by the deliberate course of action chosen by the applicant. 37 CFR 1.181 states that the examiner “may be directed by the Director to furnish a written statement, within a specific time, setting forth the reasons for his or her decision upon the matters averred in the petition, supplying a copy to the petitioner.” Unless requested, however, such a statement should not be prepared. See MPEP § 1002.01. Applications are not ordinarily reviewed for possible abandonment until the maximum permissible period for which an extension of time under 37 CFR 1.136(a) plus 1 month has expired. The applications should be carefully scrutinized by the appropriate examiner to verify that they are actually abandoned. A check should be made of files containing a decision of the Patent Trial and Appeal Board for the presence of allowed claims to avoid erroneously treating the proceedings as terminated (see MPEP § 1214.06, subsections II-IV for proper treatment of any claims that stand allowed). If the application is abandoned, the date of the abandonment is after midnight of the date on which the set shortened statutory period, including any extensions under 37 CFR 1.136, expired. This is normally the end of the 3-month shortened statutory period. Receipt of a letter of abandonment while an application is allowed is acknowledged by the Publishing Division. An express abandonment arriving after the issue fee has been paid will not be accepted without a showing of one of the reasons indicated in 37 CFR 1.313(c), or else a showing under 37 CFR 1.183 justifying suspension of 37 CFR 1.313. See also MPEP § 711.01. Abstracts were prepared and published in accordance with the Notice of January 25, 1949, 619 OG 258. Each abstract includes a summary of the disclosure of the abandoned application, and in applications having drawings, a figure of the drawing. The publication of such abstracts was discontinued in 1953. Abbreviatures were prepared and published in accordance with the procedure indicated in the Notice of October 13, 1964, 808 OG 1. Each abbreviature contains a specific portion of the disclosure of the abandoned application, preferably a detailed representative claim, and, in applications having drawings, a figure of the drawing. The publication of such abbreviatures was discontinued in 1965. An application was laid open for public inspection under the Defensive Publication Program and the applicant provisionally abandoned the application, retaining rights to an interference for a limited period of 5 years from the earliest effective U.S. filing date. The Defensive Publication Abstract and a selected figure of the drawing, if any, were published in the Official Gazette. Defensive Publication Search Copies, containing the defensive publication abstract and suitable drawings, if any, were provided for the application file, the Patent Search Room and the examiner’s search files. A defensive publication is not a patent or an application publication under 35 U.S.C. 122(b); it is a publication. Therefore, it is prior art only as of its publication date. See MPEP § 2136. The defensive publication application files are accessible by request to the File Information Unit (Record Room). Distinct numbers are assigned to all Defensive Publications published December 16, 1969 through October 1980, for example. Defensive Publications are included in subclass lists and subscription orders. The distinct numbers are used for all official reference and document copy requirements. A conversion table from the application serial number to the distinct number for all Defensive Publications published before December 16, 1969 appears at 869 OG 687. It is important that abstracts, abbreviatures, and defensive publications (OG Defensive Publication and Defensive Publication Search Copy) be referred to as publications. These printed publications are cited as prior art under 35 U.S.C. 102(a)(1) or pre-AIA 35 U.S.C. 102(a) or 102(b) effective from the date of publication in the Official Gazette. See Ex parte Osmond, 191 USPQ 334 (Bd. App. 1973) and Ex Parte Osmond, 191 USPQ 340 (Bd. App. 1976). See also MPEP § 2136. An application or portion thereof from which an abstract, abbreviature or defensive publication has been prepared may be used as a reference under 35 U.S.C. 102(a)(1) or pre-AIA 35 U.S.C. 102(a), effective from the actual date of filing in the United States, only for evidence of prior knowledge of another. These publications may be used alone or in combination with other prior art in rejecting claims under 35 U.S.C. 102(a)(1) or 103 or pre-AIA 35 U.S.C. 102 and 103. Brown, (abstract or abbreviature) of Serial No. ........, filed ............., published in OG ........., on ........, (list classification). Jones, Application Serial No. ........, filed ............., laid open to public inspection on ............... as noted at .......... OG (portion of application relied on), (list classification, if any).